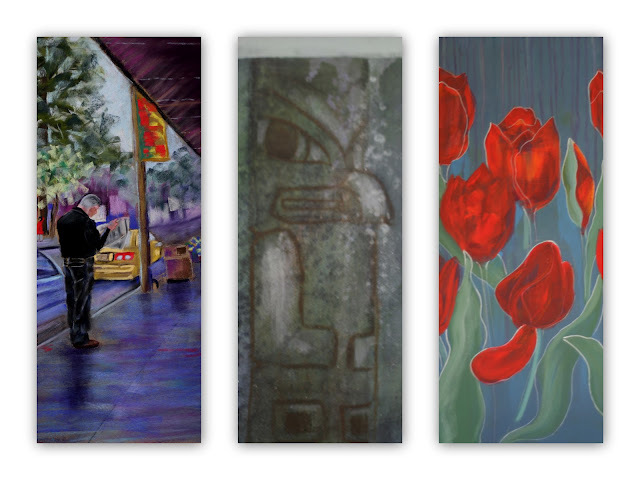 The three images above are all small parts of three different paintings that I am currently working on. The first one titled "The Sunday Paper" is in pastel and the other two are in acrylic. The two in acrylic are so different in mood, their palettes are polar opposites, one dark and mystical, the other bright and bursting with joie de vivre. I find it difficult to jump between the two. I've tried to do Work In Progress blog posts on different paintings that I've done in the past but i'm such a slow painter and I jump around from painting to painting that i'm sure you must get bored to death waiting for the next installation so I decided to do Sneak Peeks just to prove that YES I AM PAINTING! So each week I will post small sections of the paintings I am currently working on. Teaser: I can tell you one of these paintings is just getting it's finishing touches and will be posted on Monday April 9th so check back to see which one it is.